Tongue-tie, also known as Ankyloglossia is a problem that is usually present at birth. It happens when the tissue that attaches the tongue to the bottom of the mouth is too short, which can further limit movement of the tongue.The cause for tongue-tie is unknown. It can either run in families or may occur in babies who have other difficulties that affect the mouth, such as a cleft palate. But, there are children with tongue-tie who have problems like trouble latching on the mother's breast and suckling, speech problems because the tongue cannot rise enough to pronounce some sounds clearly such as t and z, they have gaps or spaces between the front lower teeth as well as personal and social problems related to restricted tongue movement such as cleaning food off the teeth with their tongue. 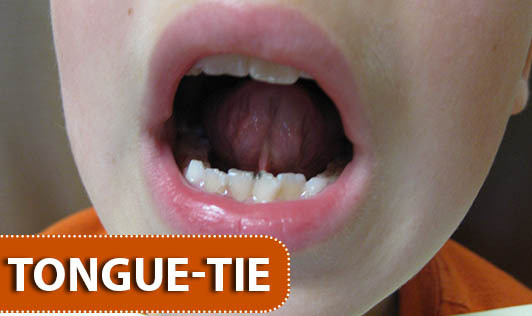 Children with tongue-tie are often made fun of by their peers, hence they tend to have a very low self esteem and sometimes, fail to achieve success due to this. The treatment for tongue-tie is an operation called Frenulotomy. This technique differs depending on the age of the child. It is a surgical procedure performed to cut the lingual or labial (tissue in the centre and lower lip) frenum. Your child will have a general anaesthetic and will be completely asleep and he or she will not feel any pain. So, if your child has tongue-tie, consult your doctor and do what's best for your child!